The cover to this book really threw me off. I thought it was going to be some kind of a dark magic or horror book. And though it’s got elements of both, it’s not at all what I expected. 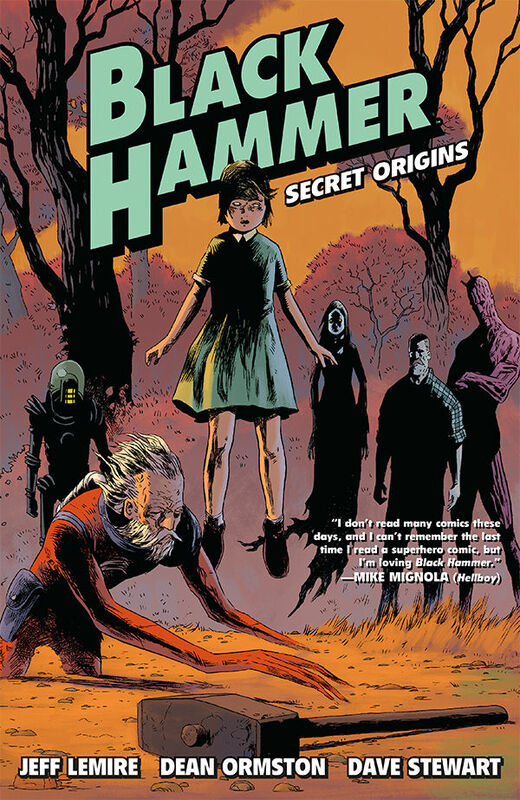 Black Hammer: Secret Origins is about a group of super heroes who have been transported to a small, rural community and cannot leave their immediate surroundings. Some of them are quite okay with this, some are ambivalent, and some are flat-out angry. The six characters–by book’s end–captured my interest and prompted me to reserve the next installment at my local library, but I still can’t go so far as to say I “like” this book (even though I am clearly invested). My primary issue is that the six characters are obvious riffs on popular DC and Marvel icons. Shazam, Martian Manhunter, Captain America, Adam Strange–they’ve all been cribbed. I found this kind of thing fascinating back in the mid-80s with Watchmen … I’m less entertained by it now. Even so, the author, Jeff Lemire, excels at dialogue and character interaction, so I couldn’t help but be drawn in by this book. Furthermore, the artwork is moody, dark, and eye-catching. I particularly appreciated the facial expressions throughout. They aren’t trying to pretend that they aren’t copying other characters, by the way. There’s no deception taking place on their part. And by the book’s conclusion, the characters have taken on a personality of their own and found themselves in an interesting predicament. In fact, I have to hand it to Lemire in regards to character development. Even though these characters begin as facsimiles, they soon become dynamic and full of engaging complications. However, after almost four decades of reading comic books, none of these obstacles are unheard of. It’s just, on a personal level, I feel like I’ve seen it all before. The characters’ powers, the angst, even the isolation. It’s all expertly-executed, but not especially fresh in my view. Perhaps the next volume will completely win me over. The good news is that I’m committed and want to keep reading this story. This entry was posted in Book Reviews and tagged arts, black hammer, books, comic books, dark horse comics, entertainment, graphic novels, review.